The Melrose Sevens has always held a special place in the hearts and minds of rugby fans but whether the blue riband tournament of the Borders circuit can retain its prestige position in the Scottish sporting calendar at a time of increasing change in the domestic game remains a big question. BBC certainly thinks so, the national broadcaster having committed to covering the event for a further two years. And there is no doubt that as a primary source of income, the Melrose club needs to ensure that its tournament remains attractive, not least because of the financial uncertainties surrounding the Super Six. This year’s start list points to a less glamorous event than of previous tournaments when provincial sides from New Zealand, professional teams from England and Scotland and top talent from Fiji graced the stage at the Greenyards. The Aberdeen Standard Investments Sevens Melrose tournament has always stood out from the others on the circuit because of the quality of the guest sides but there is little question that the 128th ‘sports’ are devoid of crowd-pulling teams. “We were disappointed when Worcester Warriors pulled out,” said sevens convenor Ian Cooper. Another team to withdraw was Romania because of what Cooper describes as “internal politics”. In their place is a Poland development team and the invitation side, the Crusaders. Poland’s senior team play on the European circuit and have hosted an international tournament in the city of Lodz. But the Poles playing today are understood to at Melrose ‘for experience’. That leaves the USA Tigers as the main focus of attention. The Tigers are a development side linked to the full USA Sevens. Only last week they put down a marker by reaching the semi-final of the Hong Kong tens tournament, the curtain raiser for the prestigious sevens event in the former UK territory. Two of their side, Naima Fualaau and Faitala Talapusi were part of the USA training squad earlier this season. The upside of the lack of top guest teams is that it opens the door for club sides to advance. Many fans, while appreciating the skills displayed by Saracens, Edinburgh and Glasgow Warriors in recent seasons, nevertheless felt that pitting amateurs against full-blown professionals was hardly a level playing field. The other view, expressed by many, is that the professionals raise the bar and offer genuine challenges for the club players aspiring to play at higher levels. The tournament will not be without professionals, however. 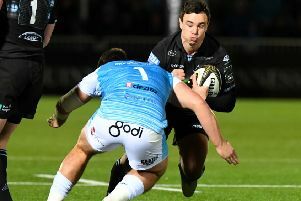 Named in the Ayr side is Rory Hughes while in the Currie side are Hughes’ Glasgow Warriors team mates, Adam Hastings and Rata Tagive, two players who could increase the chances of the Malleny Park men progressing through the rounds. If Currie defeat Glasgow Hawks in the opening tie they will face Jed-Forest in a tasty second round match. But, of course, home eyes will be on Melrose who are drawn against the winners of Cartha v Boroughmuir. Melrose, who last lifted the Ladies Cup in 2011, have already declared their desire to win the 2018 iteration as part of what they see as a quadruple success this season. Melrose have already won the BT Premiership play-offs and in two weeks will play in the Cup final. A fourth target for Melrose is the Kings of the Sevens crown, currently held by Watsonians, who should benefit an easier lower half of the draw. Today’s event is the third of the ten-round Kings competition, which culminates at Jed-Forest on 19 May.